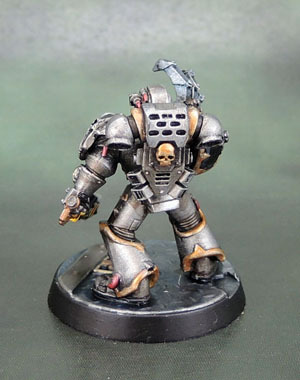 The Week of Iron: Part Two | Azazel's Bitz Box. 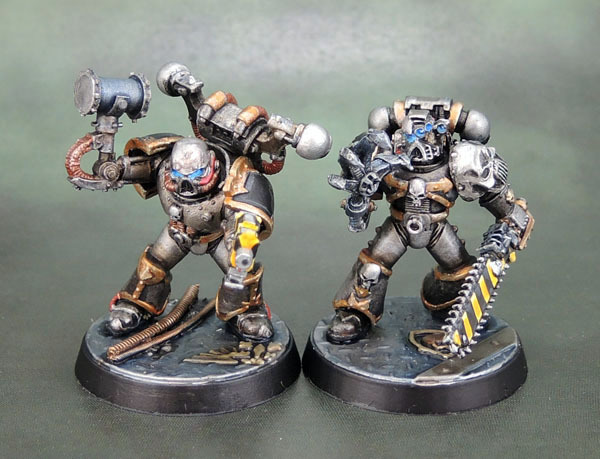 Today we have the next pair of my “Legacy” Iron Warriors – what these two have in common is the use of Necromunda Pit Slave arms as Close Combat Cybernetics. Much like their fellow reaching for the sky with his chainsaw arm in the very first set of finished close combat Iron Warriors. Hammer guy is a pretty straightforward build. Being simply CSM parts with a SM left arm with bolt pistol and the nondescript SM breastplate that lacks any form of Aquila. And the Hammer-arm, of course. I figure that the hydraulic hammer-arm can be used as a CC weapon, or in a pinch as a power weapon or even a Thunder Hammer. I guess I’ll just have to see how 8th pans out. The IV Legion badge is about as subtle as his hammer. The IW badge is on his left shoulder this time. I’ve added some hazard stripes to his backpack. I just find I need to be a little bit careful with those on models’ backpacks as I don’t want them to look like Bees or Wasps! Surely that’s a different Space Marine Chapter! His partner in causing chaos also features a lot of standard CSM parts – legs, torso and chainsword-wielding arm, along with one shoulder. 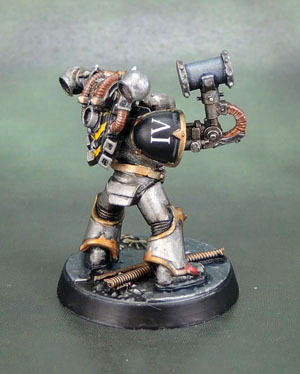 The arm is again from the Necromunda Pit Slaves and his cybernetically-enhanced metal head comes from the Iron Hands kit. The backpack is from the 3rd edition SM kit, and finally, the left shoulder is a metal CSM pad from the 2nd-3rd Edition era. 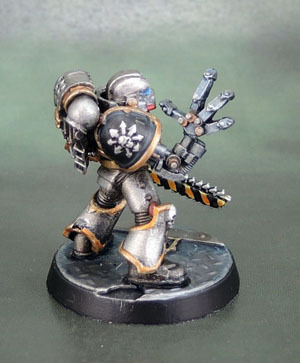 Being an Iron-painted skull, it serves as the Chapter Badge in this case. The rear view really just shows the plastic SM Backpack. If anything, I think it helps to illustrate how well a mix of modern parts has always worked with the CSM kit when building Traitor and Renegade marines. 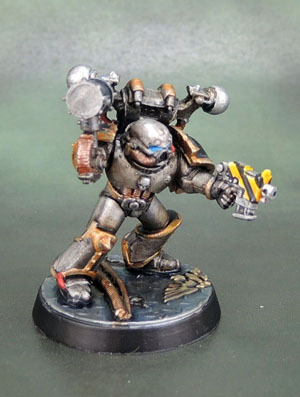 The Long War would create a convoluted logistics situation between the 5 marks of post-thunder armour that was worn by the combatants during the Heresy, since-corrupted armour, Legion-made Artificer armour and that built by individual Astartes (especially in a chapter like the IW), armour fabricated in captured Forge Worlds and by their Dark Mechanicum allies – not to mention that taken as battlefield trophies/loot. Which makes me think. I should add some Imperial Fists (and successors) trophies in with my IW somewhere. I like to think of this guy as having just recently had this huge claw installed. So the slightly odd pose represents him taking the time to admire his new limb through his many, many lenses, before using it to wrench the head off some unfortunate foe. The size of it looks like it could wrap itself pretty well around a head, or a Marine’s helmet..
Another striking duo, the blue on the hammer works particularly well. At first I was like ‘the pose for the claw isn’t that great’, but now that you have come up with a backstory for it, it is genius! You’re not wrong there – that arm has always bothered me until I figured out that little mini-narrative. Now it bothers me slightly less. The blue on the hammer is just part of my desire to vary the tones so it’s not just a pile of “spray black, drybrush gunmetal, drybrush chainmail, job done” models. 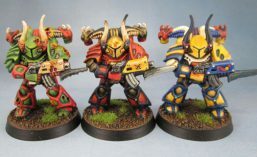 Love ’em mate, very nicely converted and painted as usual. MC Hammer and High-4 reporting for duty! I approve of the hammer time. Could be in fake latin, too: Malleus tempus. Overall excellent job on the boyz. Great weathering and a nice touch to use blue on the hammer head. Good use of stripes to break up the metal. The idea of the hydraulic hammer in battle just makes me smile. That really encapsulates the impractical medieval sci-fi tech of the 40k universe! The pose of the dude with the metal arm reminds of the scene in Terminator II were Arnie cuts the flesh off his arm and looks at the endoskeleton. The basing is also very nice. Simple, but properly evokes he enviroment these guys would fight in. 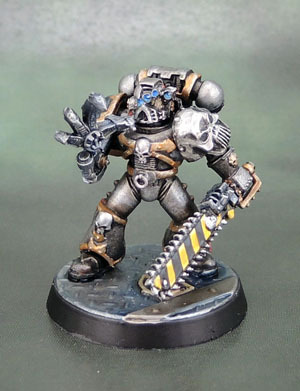 Thanks, and I agree – a hydraulic hammer that looks like an iron mallet makes perfect 40k-sense, which is to say that it’s totally unrealistic, completely impractical and somewhat insane. Just like chainsaw-swords. The Arnie scene works well also, only with a gigantic hand. I’m sold on Malleus Tempus. Though I think fitting it on that hammer might be a bit of a stretch! Actually “Sistite, malleus incipiat” sounds pretty awesome and very 30/40K. 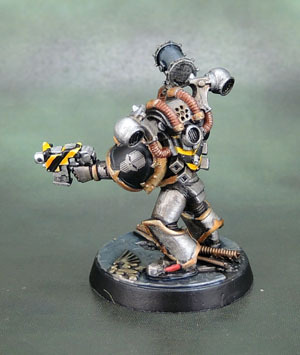 Pingback: Iron Warriors Army Building – And One More Makes Ten (and post #400!) | Azazel's Bitz Box.